Razer back is real ale surely not craft. It was Real Ale last year, but Craft Beer is the new marketing buzzword, that's what they call it now. I drink this on draft in a Marstons pub in Liverpool called The Cambridge... you'd call it something else altogether if you ever tasted that; I just go there for the atmosphere. 3.6% is what all pub beers used to be, so you could drink in the pub all night without falling over, and enjoy the social life....rather than getting bombed within an hour on 7.8%, that the brain can't cope with, and then being annoying and no use to anyone! 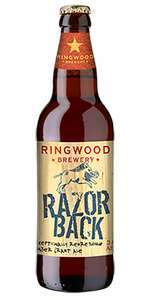 Ringwood Razor Back (I think it used to be Ringwood Best) is a great beer, and that is a teriffic price, if you can get it!